B is for Big Toe….with Foot attached! 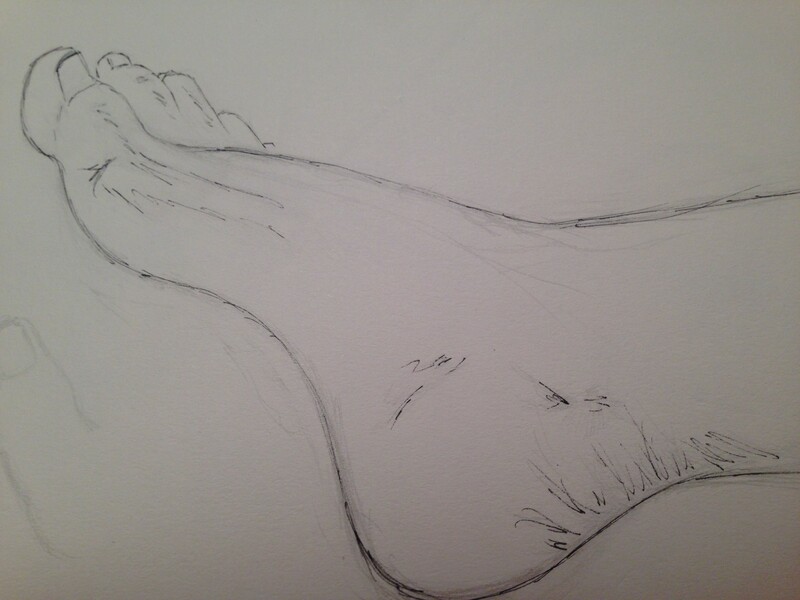 I’ve always heard feet are as difficult to draw as hands, so one night when I was up much too late, I decided to draw a side view of my foot. The drawing was not very detailed, which may be why I didn’t find it as difficult as I’d thought it would be. While sketching the sole of the foot, I used swooping, round lines with a 3H pencil, and kept re-swooping until I was happy with the line I’d drawn, then erased the others. When I was satisfied, I went over the pencil with a Micron pen so that it would show up a little better in the photograph. One thing I’ve learned so far is that the human body is really beautiful. If you stop and look at the world as lines rather than colors and shapes, the human body is as beautiful as birds, critters, flowers, or anything else I draw. It’s refreshing to look out at the world through an artist’s eyes. It makes everything look like a small miracle, really, as I notice the details, and so I start to see art as a useful exercise for anyone, whether you think you can draw or not, care about drawing, or not. If the only thing it accomplishes is that it helps you to focus on the little miracles all around you, every minute of every day….think about what that adds to your life as a whole, over time. Maybe I’m getting a bit too philosophical here, but this journey is about so much more than creating pretty pictures for me now. It’s a whole new way of living, of seeing, of … being. I’m glad to be sharing this journey with you all. Remember, I’m taking requests now for future letters. At this point, I need something for letters L through Z. (For this cycle, letters C through K are spoken for.) Have a wonderful weekend, and I hope you’ll stop by again tomorrow. I have a request. For a wooden wizard. An evil wooden wizard, specifically. Good foot drawing. I think I prefer hands to feet, though, as something to look at. Feet are kind of scary things. How about a wicked wooden wizard :P? I will try. Would be a challenge for me to draw something from my imagination but would be cool to see how it turns out! How about a mandala for M? That’s a great idea! They’re so beautiful, and I’ve never tried one. Thanks! Nicely done. I’m with you on your reflection. Between using a camera and a pencil, I’m gradually learning to see again. Body parts also make patient models. I agree that one of the most wonderful parts of being an artist is taking time to observe and really “see” what you are looking at!! It’s amazing the difference! It makes everything around you look like God just put a fresh cost of paint on it!